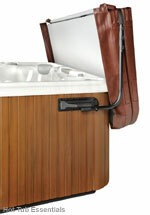 The Covermate 1, is the top selling cover lift in the hot tub industry. Easy to Use - Even the smallest of spa users can operate the Covermate 1 with ease. In fact, the exceptional design allows removal of your spa cover easier than other 'bargain brand' hydraulic cover lifts. Having the centre bar run the entire width of the cover, adds remarkable strength, thus making it much easier to remove your cover. Solid Construction -The Covermate 1 is made with black powder coated aluminum bars and non-corrosive, composite mounting brackets. The 12 point (14", 35 cm) mounting system provides the ultimate in strength. Attractive Design -The sleek, low profile, ergonomic look compliments any spa. Space Efficient -As little as 10" (25 cm), clearance behind the spa is needed. A Simple Design that works - It is proven to be absolutely trouble-free, with only one moving part and a built-in stop mechanism. There is no need to ever worry about springs or shocks needing to be replaced. Will the Covermate 1 work for your hot tub? Will it work for In-Deck Spas? Partially sunk-in is okay, as it mounts to the upper spa side of the cabinet. It will not work on Octagon, Round or Hexagon shaped spa cabinets. It will work on hot tubs with 'Cut of Corners' that measure up to 14" (35 cm). Use the Covermate 1 with Extended Brackets for larger corners. 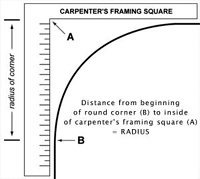 If your spa cabinet has rounded corners, the maximum corner radius this will work on is 10" (25 cm) - see below to measure the cabinet radius. If you have a 10" - 16" (25 cm - 41 cm) corner radius, you can use the Covermate 1 with Extended Brackets. 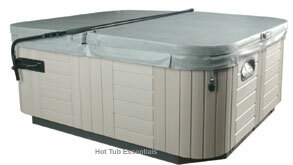 Covermate 1 specialty lifts for specific brands & larger hot tubs here. Consider the Cover Ex built by Cover Valet. It is a comparable product for less! We recommend The Spa Cover Saver to prevent damage to your hot tub cover seam. This is especially important with any center bar cover lift, if you have a large and heavy hot tub cover. As always, FREE SHIPPING on ALL orders over $149!